Just when I decided to be patient and wait for my entry to get hit, USD/CAD leaves me behind! So instead of enjoying more than 200 pips in gains, I ate my weight in ice cream while dealing with regret. I guess it’s true what they say, missing out on a good trade setup can be just as devastating as losing one. After I finished stuffing my face with all the sweets I could get my hands on, I decided that it was time to face the music. 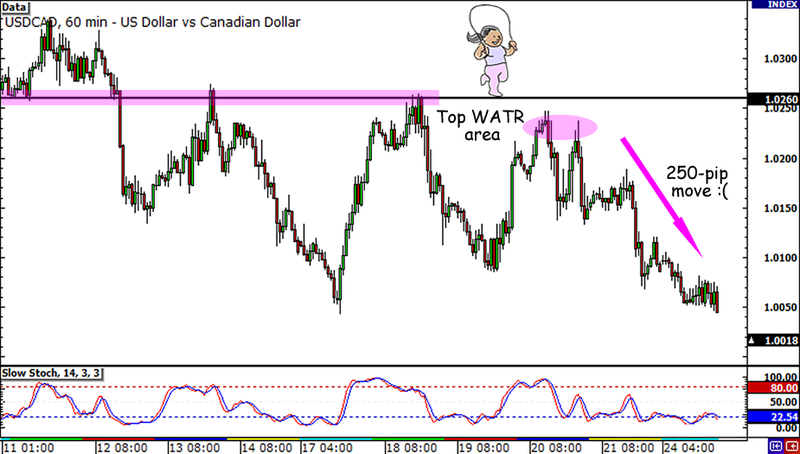 With trembling hands and a pounding heart (probably from the sugar high), I opened the USD/CAD chart to figure out how I could’ve played the trade better. As I studied the 1-hour chart, I noticed that the pair has been making lower highs and that I should’ve set my entry target slightly lower. In fact, had I entered right at the top WATR around 1.0230, I would’ve been in the trade and enjoying a 200-pip gain now. There was another opportunity to jump in the drop when the pair broke below that symmetrical triangle on Friday. Chips, dips, and let’s eat – I mean lock in – those pips! Hey guys! 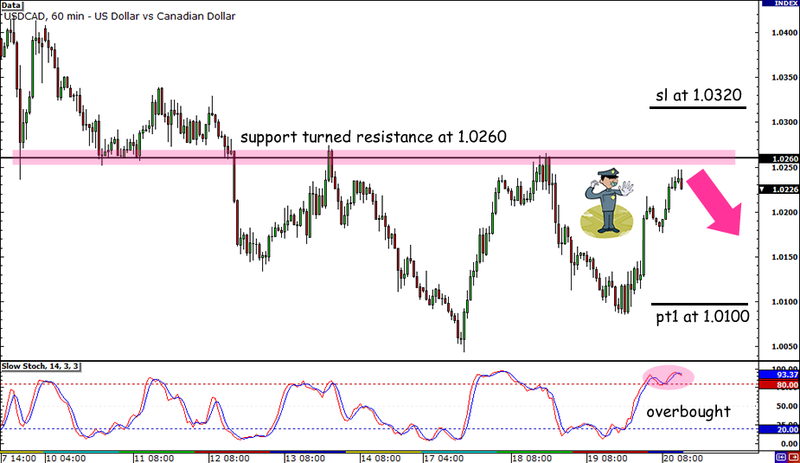 After saying by the sidelines early this week, I finally found a good setup on USD/CAD! On the 1-hour chart I spotted a nice intraweek range between the 1.0260 and 1.0100 areas. But wait, there’s more! If you stretch your charts a bit you can see that the 1.0260 level has been a pretty significant support and resistance level for the past couple of days. Of course, it also helps that it’s near the 1.0250 psychological level resistance, DATR, and WATR! Oh, if you have no idea what those last two acronyms stand for, you should stop guessing and just check out my entry on my trading strategies instead. The fundamental side of the trade setup is where my idea gets iffy. Lately we’ve been hearing talks of a solution to the euro zone debt crisis, but most of them turned out to be rumors. What I do know for sure is that Canada has been clocking in mixed economic reports this week, and that yesterday the oil received a good boost from the oil inventory report. For this week I plan on shorting the pair at the 1.0260 area and place my stop around 1.0320, ¼ of the pair’s DATR. If my the pair goes with my trade I’ll place my first profit target at 1.0150 and probably trail my stop on the remaining half until the bottom of the range. What do you think of my trade idea this week? You think I’ll finally make some pips? Give me a shoutout on one of these pages! Chips, dips, and gimme those pips!